At 5'7" and 155 pounds, Chris Schoeck is an unlikely strongman. Professional Strongman Chris Schoeck is running. He wears an orange jacket and black wool cap, the camera close on his bobbing head. The sky is grey and for a moment, as Chris pauses before he turns back, the river stretches before him. "I've lived in New York all my life, 43 years," he says in voiceover, "But I don't feel like I belong here. There's a part of me that has always felt extraterrestrial." The moment is beautifully composed, a series of mobile frames that reflect Chris' resolve as well as his isolation. As he turns around, jogging back from where he came, the city appears at a distance in the smudgy morning light, at once home and another planet. It's the sort of contradiction that shapes Bending Steel, a documentary that follows Chris' efforts to become a strongman, the sort of performer who used to wow crowds on Coney Island back in the day. At first, this ambition sounds exactly right, an apt occupation for someone who feels "extraterrestrial". But as Dave Carroll and Ryan Scafuro's film reveals, Chris sees in his dream a means to feel less alone, more connected, more human. "There's no feeling like feeling that steel give, nothing like it," he explains, "When you learn to bend steel, it feels like you can overcome anything." Screening on 13 January at the Doc Yard, Bending Steel shows Chris' complex circumstances, his work with mentor Chris "Haircules" Rider, as well as his visits with other members of the strong man community. As these role models demonstrate their techniques and offer advice, Chris listens intently and claps appreciatively at the end of stunts. Even as all strongmen perform remarkable and legitimate feats ("What I'm doing is not magic"), each also tends to have a signature: Rider lifts weight with his long red locks, Slim The Hammerman Farman wields massive hammers, most sensationally just over his forehead. Chris means to bend steel. The importance of the signature stunt underscores a key component in being a strongman, which is to say the performance per se. "I feel that in order to engage the crowd," Chris says, "You have to be a little self-deprecating and have to sort of show a little humility, a little vulnerability, in order to invite them into my arena." His own forays into such engagement need work, you see from early on. As you watch him watching 76-year-old Slim the Hammerman, Chris' face lights up, impressed not only by the stunt but also the veteran's serenity and patience ("You know when you're ahead, you're the best thing that's gonna hit that stage," Slim advises, "I don't know if I have it or not, but that's what I try to project"). For his part, Chris is Nervous and awkward on stage, he mistimes jokes and speaks too personally. But then, as strongman Dennis Rogers observes, this seeming naiveté has its own appeal. At 5'7" and 155 pounds, Chris is an unlikely strongman. "We have to take him as different from the rest of us," Rogers tells Rider as Chris struggles and grunts during a stunt. "You wonder how the heck this guy does what he does. Look at Opie Taylor bending steel bars!" Even as the guys come up with a stage name for the newest member of their community -- Chris Wonder Schoeck -- the film reveals other facets of Chris' experience, his efforts to overcome his fears and doubts. These efforts shape Chris' performances. Rider instructs him to position himself as a show ("Turn now, the crowd can see what you're doing, they see your face, they can see your arms straining") and also suggests that he use a camera to tape all his training and also, to rehearse his patter. Chris positions a camera across the room, surveillance-style, in his apartment: he sits with cigar in his hand and ice pack on his shoulder, developing his Wonder affect. At the storage facility where he keeps his steel (horseshoes, bars, nails), Chris records his rehearsal, the camera again above and apart from him, the storage cage providing a narrow frame as he formulates the lines he'll use on stage and blocks out how he'll rip a phone book in half or bend the steel bar. These solo self-performances are alongside scenes at his parents' home. When he and Rider visit for dinner, Chris' mother Julia chops vegetables in the kitchen, then sits mostly silently as her husband Bernard wonders whether his son's is hoping for a career that's "a little like the magician racket." Well, Chris suggests, "It's the same grab, but it's real," hoping to impress on them the effect of seeing "a little guy get up there and then bend some serious stuff." Bernard appears unimpressed by Chris' demonstration ("Take it slow, get your breath back"), and in this, you see how Chris might have come to feel "extraterrestrial." As he puts it, not so abstractly, it's difficult to have "somebody close to me for a long time that I feel is rooting against me." 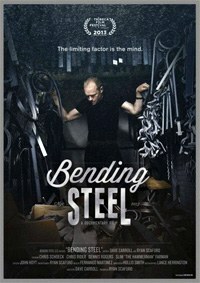 In such complexities, Bending Steel reveals Chris' strengths. For as uncomfortable and uncertain as he can feel and also appear, sometimes painfully, he finds support in the strongman community. Rider and Rogers and Slim the Hammerman encourage him and also see in him aspects of themselves. Now that he's in "the breaking free stage", says Rogers, "He's discovered something in himself that he never knew was there, and he sees others who have discovered this and he sees them at different levels and he sees the path where he can go." It's a family for him, Rogers observes, and so do you.